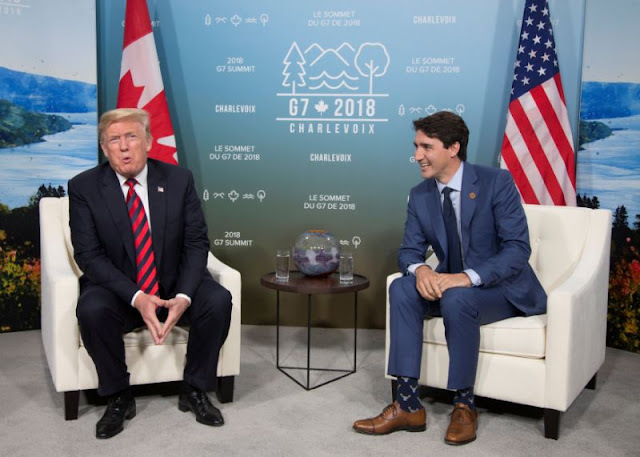 VietPress USA (June 10, 2018): G-7 Summit with Trump in Canada broke a spat that both Canada and The United States now criticized each other. Yesterday Trump left G-7 Summit without sign the Summit Declaration with other Leaders. Onboard the Air Force One to Singapore for Tuesday's summit with North Korea's Kim Jong Un, President Donald Trump tweeted that Canadian Prime Minister Justin Trudeau is "dishonest & weak" and that the U.S. was pulling back its endorsement of the G-7 summit's communique in part because of what he called Trudeau's "false statements" at a news conference. Trump threw the G-7 summit into disarray Saturday and threatened to escalate his trade war just as Canada released the G-7's official communique. Its statement took a generally positive view of the leaders' positions on trade matters while acknowledging tensions with the U.S.
Today on Sunday, Leaders of Europe sharply criticized Trump's decision to abruptly withdraw his support for a Group of Seven communique hammered out at a Canadian summit on Saturday, accusing him of destroying trust and acting inconsistently. QUEBEC CITY, Quebec (Reuters) - The United States and Canada swung sharply toward a diplomatic and trade crisis on Sunday as top White House advisers lashed out at Canadian Prime Minister Justin Trudeau a day after U.S. President Trump called him "very dishonest and weak." "Canada does not conduct its diplomacy through ad hominem attacks ... and we refrain particularly from ad hominem attacks when it comes to a close ally," Canadian Foreign Minister Chrystia Freeland told reporters on Sunday. Freeland reiterated Canada will retaliate to U.S. tariffs in a measured and reciprocal way, adding Canada will always be willing to talk. White House economic adviser Larry Kudlow accused Trudeau of betraying Trump with "polarizing" statements on trade policy that risked making the U.S. leader look weak ahead of a historic summit with North Korean leader Kim Jong Un. Trump arrived in Singapore on Sunday for the summit that could lay the groundwork for ending a nuclear stand-off between the old foes. Freeland, asked about support from allies, said: "The position of our European allies, including Japan, is the same as ours. We coordinated very closely with the European Union, with Mexico, on our list of retaliatory measures and actions." Europe will implement counter-measures against U.S. tariffs on steel and aluminum just like Canada, German Chancellor Angela Merkel said, voicing regret about Trump's decision to withdraw support for the communique. Canadian officials, including Trudeau, have fanned across America as part of a months-long charm offensive to appeal to pro-trade Republicans at every level. But even those vested in Canadian trade are not expected to come to Trudeau's defense as long as the U.S. economy is roaring. "I think the pushback by Congress is going to come up incredibly short," Chris Barron, a pro-Trump Republican strategist, said of Republican efforts to rein in Trump. Trump's backing out of the joint communique torpedoed what appeared to be a fragile consensus on a trade dispute between Washington and its top allies. "The G7 was a forum for friends – democracies with the same value system – to discuss issues of common interest. Now there is a question mark over that. But it did not start with this G7, but with the election of Donald Trump," said a European official. "In a matter of seconds, you can destroy trust with 280 Twitter characters," German Foreign Minister Heiko Maas said when asked about Trump's U-turn. "This is of great concern to the G7. I do not know where we go from here. It is impossible to predict what Trump will do next," said a senior G7 official on the summit outcome. "The world as we know it, namely the U.S.-led rules-based multilateralism, is now in serious danger of unraveling, as illustrated at the G7 meeting," said Erik Nielsen, chief economist at Unicredit Bank. South African President Cyril Ramaphosa, who met with Trudeau on Sunday, said it was time for G20 nations to play a role and to "also bring about some good sense to all the key players." "The G20 helpfully has more countries that have a stake in the economy of the world, including the G7," he told Reuters. Canada's Freeland, who met with U.S. Trade Representative Robert Lighthizer on Friday, said she would speak to him later on Sunday, adding that she believes a deal to renew the North American Free Trade Agreement is still possible. "We are convinced that a modernization is perfectly possible, we are convinced that common sense will triumph," she said.